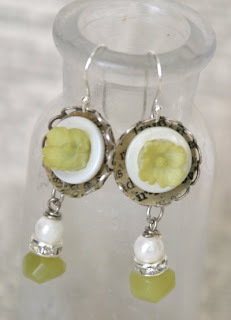 new jewelry in the store !!! 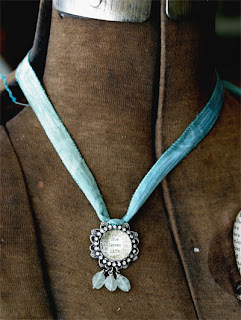 These new necklaces are soo fun - you can wear them as a bracelet or a necklace - They have hand dyed silk ribbon that is sewn on the sides and bits of gemstones hanging from the bottom - They will be available in several different colors soon !! 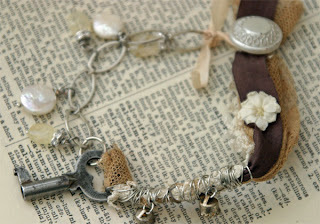 and then this new One of a Kind bracelet will be listed soon - it screams vintage love !!! I have had it sitting on my table for awhile and yesterday it finally came together ! I will definitely have a hard time parting with this one !! Beth, these are all stunning...i love the ribbon you used on the first one...the bracelet is really special...i can see how you would want to keep it for yourself!!! you are killing me with all this goodness!!! 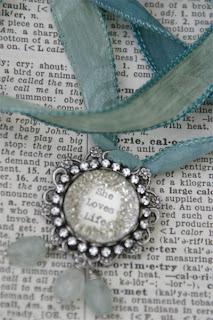 Ooh I love the "She Loves Life necklace"!! Love that last bracelet! Just beautiful! They are all gorgeous Beth, but I love the "one of a kind"! i am so tickled--i just bought one, finally!!! Wow Beth you just keep reinventing yourself...beautiful bracelet, and ribbon necklace. I love it all! Just bee-u-tee-ful, how do you do it all. Just to let you know...I just posted the "Yaya Treasures" for today and posted about your designs in the shop and then linked it back to you! my necklace arrived today & i am thrilled to finally own one of your pieces. may i use the first picture on my blog to post about your jewelry?